Sharjah-based Dana Gas has announces that during Q1 2019, Pearl Petroleum has received $112 million (AED 411mm) from the sale of condensate, LPG and gas in the Kurdistan Region of Iraq (KRI). Dana Gas is a 35% shareholder in Pearl Petroleum and accordingly, its share of such receipts by Pearl Petroleum is $39 million (AED 143mm). This presents a 117% increase compared to the Company’s Q1 2018 share of collections which stood at $18 million. As of today, Pearl Petroleum has no overdue receivables in the KRI. In February of this year, Pearl Petroleum signed a new 20-year Gas Sales Agreement (GSA) with the Kurdistan Regional Government (KRG) to enable production and sales of an additional 250 MMscf/d. The Consortium aims to bring this production on-stream by 2021 as part of their expansion plans to raise output from the current 400 MMscf/day to 650 MMscf/day in 2021, and then to 900 MMscf/day by 2022. Posted in Dana Gas, featured, Iraq Oil & Gas News, mn, Pearl Petroleum, Sharjah, United Arab Emirates (UAE). Sharjah-based Dana Gas has announced that its average production for Q1 2019 has increased by 6% year-on-year to 68,700 boepd from 65,000 boepd in Q1 2018. The first quarter production increase was led by the Kurdistan Region of Iraq (KRI), which leapt to 32,750 boepd in Q1 2019 from 26,300 boepd in Q1 2018. This increase was principally due to additional production from the completed debottlenecking project that came on-stream in October 2018 and took gas production in the KRI from 300 MMscf/d to 400 MMscf/d, an increase of over 30%. On a quarter by quarter comparison, Q1 2019 production grew by 5% from Q4 2018, reflecting the increase in production from the KRI and supported by having brought the Balsam-8 well in Egypt on-stream in Q4. “The two major growth projects completed in 2018 – the debottlenecking project in the KRI and the Balsam-8 well in Egypt – have proven to be materially value accretive both operationally and financially. Posted in Dana Gas, Egypt, featured, gas production, Iraq Oil & Gas News, Khor Mor, Kurdistan News, mn, Sharjah, United Arab Emirates (UAE). Dana Gas PJSC, the Middle East’s largest regional private sector natural gas company, announces that as a result of the ramp up of production from its debottlenecking project in the Kurdistan region of Iraq, its group production reached 70,000 barrels of oil per day (boepd) on the 19 November and has since been sustained above that level. The Company’s principal operations are in the Kurdistan Region of Iraq (KRI) and Egypt, where the drilling of the Balsam-8 well has also led to a sharp increase in overall production. Current group production, in excess of 70,000 boepd, represents a significant increase compared to the Company’s 9M 2018 average of 62,250 boepd. “Production in excess of 70,000 barrels oil equivalent per day is a great achievement for Dana Gas. At the start of the year, we planned a drilling programme in Egypt and a debottlenecking project in the KRI that would significantly increase production. We have successfully delivered both projects. The increase in production will help offset the lower realised hydrocarbon prices that have impacted the oil industry in the last quarter and support growth in our revenue and net profit figures for the full year 2018 and beyond. In the fourth quarter 2018, Dana Gas Egypt completed the drilling of the Balsam-8 well and tied it in to the network. The well was completed ahead of schedule and under budget, adding over 5,000 boepd to the Company’s output. 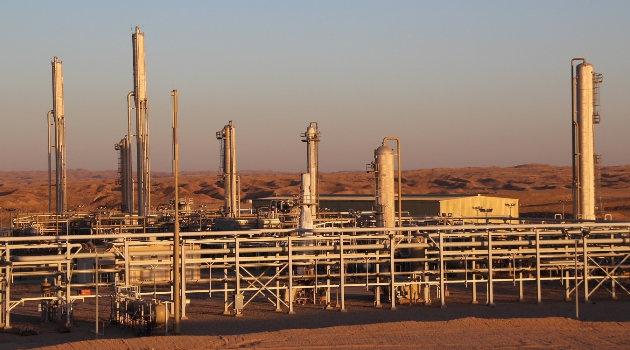 In the KRI, the Company announced a 30% increase in production capacity at the Khor Mor field (pictured), which it jointly operates on behalf of Pearl Petroleum. The expansion of the gas processing plant consisted of a series of plant additions and modifications to de-bottleneck throughput, raising output capacity from 305 MMscf/d of natural gas to 400 MMscf/d, with over 15,000 barrels per day of condensate. This is expected to add up to $50 million annually to the top line without incurring any additional operational costs. The Company recently posted a strong set of quarterly financial results. 9M 2018 revenue increased 6% to $351 million (AED1,287 mm) from $330 million (AED1,210 mm) over the same period last year and 9M 2018 net profit was $41 million (AED149 mm) versus a net loss of $6 million (AED22 mm) in 9M 2017, excluding one-off items. Posted in Dana Gas, Egypt, featured, Iraq Oil & Gas News, Khor Mor, Kurdistan News, Sharjah, United Arab Emirates (UAE). Dana Gas, the Middle East’s leading publicly-listed regional natural gas company, and its partner Crescent Petroleum, have announced achievement of a 30% increase in production capacity at the Khor Mor field in the Kurdistan Region of Iraq, which the companies jointly operate on behalf of Pearl Petroleum. This increase delivers much-needed gas supply to fuel power plants in the region, and marked a major milestone as the companies commemorate 10 years of continuous production in the region in a special ceremony with the Kurdistan Regional Government in Erbil. The expansion at the Khor Mor gas processing plant consisted of a series of plant additions and modifications to de-bottleneck throughput, raising output capacity from 305 MMscfd of natural gas to 400 MMscfd, with over 15,000 barrels per day of condensate. The Plant, which began operating in 2008, supplies natural gas from the Khor Mor field by pipeline to power plants in the towns of Chemchemal and Erbil, and will soon supply a new plant in Bazian. The Khor Mor Plant also produces LPG and NGL, which are sold and trucked to the local markets. Under a Gas Sales agreement signed in January 2018 with the KRG Ministry of Natural Resources, Pearl Petroleum will sell the additional quantities of gas to supply the power stations with affordable, environmentally favourable fuel, and further enhance electricity supplies. The plant expansion comes online as Pearl celebrates a decade of production in the KRI. At a ceremony in Erbil attended by Kurdish Regional Government Prime Minister Nechirvan Barzani, Minister of Natural Resources Dr. Ashti Hawrami, and other senior officials, Board Members and senior executives from the companies commemorated the partnership between the companies and the KRG in delivering progress and improved services to the people of the region over the past decade. Total investment in the Kurdistan Gas Project to date exceeds $1.4 billion with total cumulative production over 250 million barrels of oil equivalent (boe), which has resulted in over $20 billion of fuel cost savings and economic benefits for the Kurdistan Region and Iraq as a whole. Further investment is underway to expand production to 900mmscfd per over the coming 3 years, together with associated liquids. “This production increase marks an important milestone as we also commemorate ten years of continuous production, and the beginning of a new chapter of expansion in operations and production which will see a further investment of over $600 million over the coming few years and a more than doubling of production again. In August 2017, Pearl Petroleum reached a full and final settlement with the KRG of the arbitration between them, including receiving $1 billion in cash from the KRG for past receivables and committing to expand their investment and operations in the region. These expansion plans include a multi-well drilling program now underway in both the Khor Mor & Chemchemal fields, as well as installation of additional gas processing and liquids extraction facilities. Operation full-time staff numbers are over 600 with over 80% local staff, and training programmes to increase this figure further. In addition, the companies has contributed to local communities with support for local power generation, education and healthcare facilities, as well as support programmes for internally displaced people in Iraqi. The Kurdistan Gas Project was established in 2007 as Dana Gas and Crescent Petroleum entered into agreement with the Kurdistan Regional Government (KRG) for exclusive rights to appraise, develop, produce, market, and sell petroleum from the Khor Mor and Chemchemal fields in the Kurdistan Region of Iraq (KRI). Production from the newly built plant in Khor Mor began 15 months later, in October 2008, an industry record. In 2009, Pearl Petroleum was formed as a consortium with Dana Gas and Crescent Petroleum as shareholders, and with OMV, MOL, and RWE joining the consortium subsequently with a 10% share each. Posted in Chemchemal, Crescent Petroleum, Dana Gas, erbil, featured, Iraq Oil & Gas News, Khor Mor, Kurdistan News, Pearl Petroleum. As Iraq’s security conditions have improved, international donors have turned their attention to other troubled parts of the world, leaving many IDP camps in the country on the brink of closure. Nearly 2 million Iraqis remain displaced within Iraq, a vast proportion of them still in camps for internally displaced people (IDPs). From victims of conflict who have lost homes and livelihoods to families too afraid to return to their homes after the violence of recent years IDPs remain among the most vulnerable population in the country. After the trauma of violence and displacement, families in the camps continue to rely on the safe, supportive and nurturing environment in the camp to start rebuilding their lives. But with charitable funding drying up, many camp facilities, especially health care centres, are facing imminent closure. A key part of the health programme at the camp are the Woman Health Volunteers (WHVs), who are the front line to identifying health and wellbeing issues among the residents and are trained to deliver health care when needed. Between April and June of this year, the WHVs made thousands of home visits to families at the camp, providing basic healthcare services and delivering health advice, in addition to providing mental health outreach. In all, the WHVs offered support and services to more than 15,000 people during the spring period. One AMAR WHV, Thikra, for example, recently paid a visit to the Jamila family in the camp. One of the family’s sons had been showing distressing changes in behaviour, including fatigue, excessive sleep and weight gain. Thikra identified the signs of depression in the boy and confided in Mrs. Jamila to openly discuss her son’s symptoms. She then advised the mother to seek a medical assessment for boy’s the condition and set the family on the path to recovery. The companies also provide funds for vocational training programmes in the camps, including sewing and design, IT, and English lessons, providing residents the opportunity to develop skills that can boost their chances of finding employment or to set up their micro-business of their own. Crescent Petroleum and Dana Gas are among the largest private foreign investors in Kurdistan. Their focus is on developing the region’s natural resources in sustainable way to deliver lasting benefits to local communities. Their US$1.1bn development of the Khor Mor gasfield provides the natural gas to power electricity plants in Erbil and Chamchamal, delivering 1,700 MW of electricity to over 4m people living in the region. Posted in AMAR Foundation, AMAR International Charitable Foundation, Business, Crescent Petroleum, Dana Gas, erbil, featured, Healthcare, humanitarian assistance, IDPs, internally displaced persons, Iraq Education and Training News, Iraq Oil & Gas News, Khanke IDP camp, Refugees, United Arab Emirates (UAE), United Kingdom. Dana Gas has said it has received $43.8 million in dividends from Pearl Petroleum Company Limited for condensate and LPG sales in the Kurdistan Region of Iraq (KRI) in the first half of 2018, including a $7 million payment for the month of June. The company added that the capacity to process gas and condensate from the Khor Mor field (pictured) will increase by 580 MMscf/d and 20 mbbld, respectively, with the expansion programme is on track to deliver an increase in output of 80 MMscf/d by Q3 2018. Posted in Abu Dhabi, Abu Dhabi Securities Exchange (ADX), Dana Gas, featured, Iraq Oil & Gas News, KRG, Kurdistan News, Pearl Petroleum, Sharjah, United Arab Emirates (UAE). The Kurdistan Regional Government (KRG) and Pearl Petroleum have signed an agreement to increase production of gas from the Khor Mor field later this year, to boost much needed electricity generation for the people of the Kurdistan Region and Iraq as a whole. The 10-year gas sales agreement will enable gas production from Khor Mor field to increase by 25% later this year, from 320 million cubic feet per day currently to 400 million cubic feet per day. As part of a final settlement of arbitration in August 2017, Pearl Consortium, which is led by Crescent Petroleum and Dana Gas, committed to expanding their investment and operations in the region. The companies plan a multi-well drilling program in the Khor Mor and Chemchemal fields, as well as installation of new gas processing and liquids extraction facilities. The overall aim is to increase gas production by a further 125% within two years, to 900 million cubic feet per day. KRG also welcomes Dana Gas and Crescent Petroleum’s expansion of their local training and employment programs, as agreed in the arbitration settlement. The companies employ close to 500 full-time local personnel representing over 80% localisation, and have training programmes to increase this figure further. Posted in Chemchemal, Crescent Petroleum, Dana Gas, Electricity In Iraq, featured, gas production, Iraq Oil & Gas News, Khor Mor, KRG, Kurdistan News, Pearl Petroleum. UAE-based Crescent Petroleum is reportedly planning a significant increase in its production of natural gas at its Pearl Petroleum operations in Iraq. President Badr Jafar (pictured) is quoted as saying that there will be an investment of $1 billion to boost production to 500 million cubic feet of gas per day by 2020, up from about 330 million cubic feet and about 20,000 barrels per day of condensates at present. According to Reuters, Pearl is owned 35 percent by Crescent Petroleum, 35 percent by Crescent’s affiliate Dana Gas, 10 percent by Austria’s OMV, 10 percent by Germany’s RWE, and 10 percent by Hungary’s MOL. Posted in Abu Dhabi, Austria, Crescent Petroleum, Dana Gas, featured, Germany, Hungary, Iraq Oil & Gas News, MOL, OMV, Pearl Petroleum, RWE, United Arab Emirates (UAE). 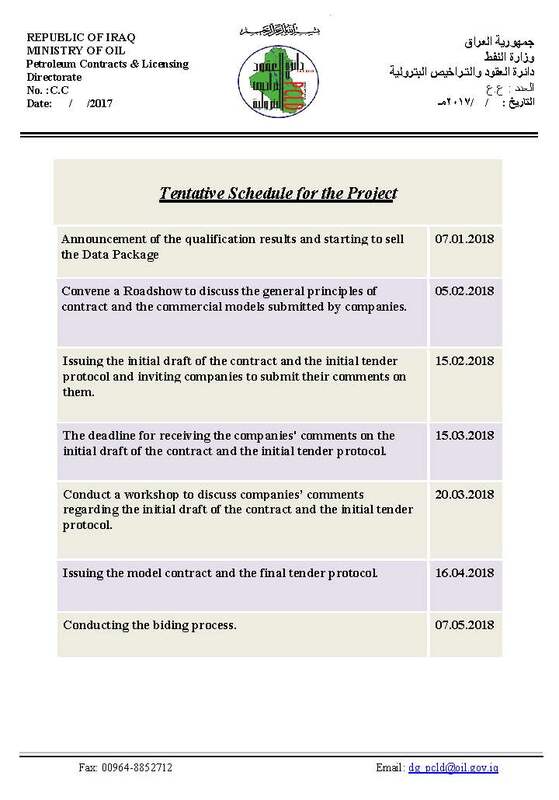 Eight companies had applied for approval. The areas to be offered include the onshore exploration blocks of Khudher Al-Mai, Jebel Sanam (Jabal Sanam) and Umm-Qasr on the Kuwaiti border; the Sindbad, Huwaiza, Shihabi, Zurbatia and Naft Khana blocks on the Iranian border; and the offshore exploration blocks in the Iraqi regional waters of the Arab gulf. Posted in 5th round energy licences, Business, China, Dana Gas, Dragon Oil, featured, Geo-Jade Petroleum, Iraq Oil & Gas News, licence round, PCLD, Petroleum Contracts and Licensing Directorate, Russia, Schlumberger, United Arab Emirates (UAE), United States, Zarubezhneft.